Energy problems can be differentiated into the following three broad categories:1. Oil supply disruptions. These can cause both large short-term price increases and huge short-term economic losses. Some of the price increase impacts may persist after the disruption is over. Energy policies to address this problem, such as oil stockpiles, must have impacts beginning in a zero- to five-year time frame. Douglas B. Fried and William F. Hederman, Jr. The United States, reacting to rising prices and supply uncertainties of imported energy, has begun to move aggressively to develop its untapped domestic energy resources. The Department of Energy has recently awarded funds to support feasibility studies as well as design, engineering, and construction activities for 110 synthetic fuel projects. Despite pressures for budgetary restraint, Congress has steadily increased (in real terms) budgets for research and development for a variety of technologies utilizing solar and geothermal energy. The federal government has leased potentially oil-rich offshore tracts in the Northeast despite strong opposition from the fishing industry and environmental groups. Yet, despite this apparent scramble to exploit domestic energy resources, a variety of factors has delayed construction of the pipeline that would transport natural gas from deposits on Alaska's North Slope to gas markets in the lower 48 states. According to public opinion polls, many people in the United States do not agree that there is truly an energy crisis. President Carter referred to it as an "invisible" crisis in the National Energy Plan of 1977. The concept of energy analysis has attracted much attention during the past few years. 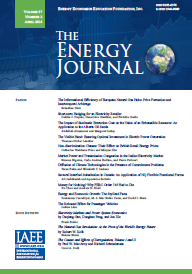 The notion that the energy content of goods and services should be closely studied, an idea that originally appealed only to specialists in certainscientific and technical fields, has recently aroused the interest of a wide range of researchers and public policy decisionmakers, particularly since the formation of the OPEC oil cartel. This article gives some analytical results of an attempt to optimize economic and thermodynamic efficiency simultaneously. The attempt to impose complete mathematical rationality and consistency on the pricing of energy commodities fails. since it is not possible to weigh consistently purely physical efficiency measures. much less social factors. This means that energy or entropy theories of value must suffer the fate of other single-factor theories. such as the labor theory of value. Such a single-factor theory cannot adequately handle such questions as fixed capital, subjective utility. and contradictory constraints on economic choice. Rising costs in the electric utility industry have focused attention on ways to control or adjust kilowatt-hours (kWh) consumed during certain hours of the day. The economist's solution has tended to involve support for peak load pricing (PLP). In theory, PLP structures are supposed to reflect the opportunity cost to society of providing electricity at particular hours. However, the problem of measuring marginal opportunity costs is difficult at best, and few electricity-pricing schemes that have been proposed set prices equal to marginal opportunity costs. Furthermore, there are costs involved in using price signals: monitoring hourly electricity consumption involves further capital expenditures; consumer acceptance and understanding of complex pricing schemes is questionable; and, even if the "correct" signals are given, it is not clear that residential (and other) consumers are responsive to higher prices during periods of peak usage, and this ambiguity complicates the electric utility planning process. Energy planners in developing areas have become increasingly interested in the possibility of using alcohol-either ethanol (grain alcohol) or methanol (wood alcohol) as a substitute for gasoline refined from imported oil. The most prominent example is Brazil, where there has been interest in alcohol fuels for the past fifty years, and where a serious alcohol program has been in place since 1975 (Hammond, 1977). Brazil is the leader, but not the only participant, in such work. Other Latin American countries, like Costa Rica and the Dominican Republic, have expressed great interest in alcohol, and Colombia has committed itself to large-scale production of alcohol during the 1980s. Asian countries, such as Thailand and Indonesia, have investigated the option, and serious work is being done in Papua New Guinea (IEE, 1980, pp. 27-29). And, of course, planners in Third World countries are influenced by the current gasohol program in the United States, by programs in New Zealand and Australia, and by experiments with methanol in West Germany and Sweden (LEE, 1980, pp. 24-26).